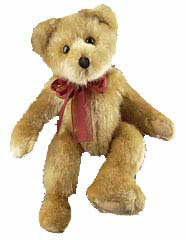 Adorable silky brown plush bear named "Lil' Sebastian". Looks great added to the outside of a gift basket arrangement or inside if there's room. 12" measured from tip of ear to tip of toe.